In 1907, the east side of Government Street between Trounce Alley and Fort Street held a collection of late-19th-century commercial buildings. 1113 Government – Victoria Book and Stationery Co. Ltd. In 1910, disaster struck this area when a huge fire destroyed almost every building in the area bounded by Trounce Alley, Government, Fort and Broad Streets; only the Times Building at the northeast corner of Fort and Broad survived. David Spencer who had lost his retail outlet in the fire, seized the opportunity to buy the damaged Driard Hotel and Victoria Theatre for $370,000 giving Spencer’s store frontage on Douglas, View, and Broad Streets. He later sold his growing business to the Timothy Eaton Co.
After the fire, the City decided to continue View Street from Broad Street through to Government, creating new street frontage and creating the street we have today. There was quite a debate about what the new extended street should be called; some called for View as the original View Street had run from the harbour to Cook Street before being permanently closed off in 1858. Others opted for Bastion to continue the street that existed at that time from Wharf Street to Government. A new six-storey commercial building rose on the site between Trounce Alley and the new View Street. Designed by A. Arthur Cox for the Union Bank, and built in 1912, it featured white-glazed terra cotta on the main floor, as quoining blocks, window surrounds, and for the Beaux-Arts cornice. This is now the site of retail on the main floor along both frontages with offices above. Also lost in the 1910 fire was the Five Sisters block which had been built in 1891 on the northeast corner of Government and Fort Streets, opening just in time for Christmas. Besides the merchandise lost from retail stores, it was a calamity for local architects. All the plans drawn by the virtual who’s who of Victoria architecture were lost. 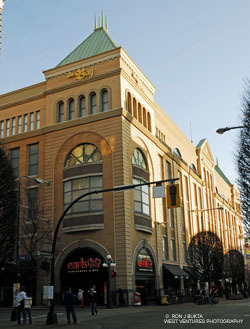 New buildings arose along this street as well, and all were demolished in 1999 when Cadillac-Fairview built the Eaton Centre (now The Bay Centre) on two complete city blocks, bordered by Government, Fort, Douglas and View (and encompassing Broad Street) in downtown Victoria.